Palapon is celebrating 10 years of Transforming Lives! We're giving YOU the chance to transform your life and be REBORN! WIN a 2 month ALL-INCLUSIVE personalised program here at Palapon Weight Loss Camp and Fitness Retreat in tropical Thailand paradise! This contest is OPEN to EVERYONE over 18 years of age, WORLDWIDE with Return flights INCLUDED! We will take care of EVERYTHING! Send us a video of yourself explaining why you need to be REBORN! Your video needs to be a MINIMUM of 30 seconds and a MAXIMUM of 3 minutes in length. Be as creative as you like! What are you waiting for? This is a ONCE in a LIFETIME Opportunity! Get filming! Once you're ready upload your video and complete the Entry Form BEFORE 11th May 2019. 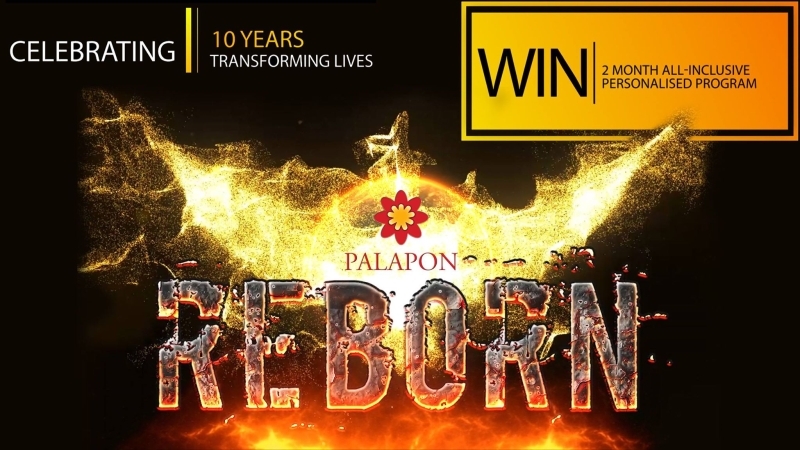 By entering the Palapon DARE TO BE REBORN Contest 2019 you confirm that you are at least 18 years of age, agree to our terms and conditions and are able to come to Palapon Weight Loss Camp and Fitness Retreat in Thailand between closing date and 31st July 2019 and stay for the FULL 2 month program. The contest is organised by Palapon Weight Loss Camp and Fitness Retreat. Palapon is a trading name of Wing Tsun Kung Fu Camp Co.,Ltd. (Company number 0775549002225 registered in Thailand) 155/20 Moo Baan Nong Kae, Hua Thanon, Hua Hin, 77110 Prachuabkirikhan, Thailand. The contest is open to EVERYONE over 18 years of age with no restriction on nationality or country of residence. By submitting your video to the contest you confirm that it is your original work produced and processed by you and does not infringe on any other right of a third party. Your video must be a MINIMUM of 30 seconds and a MAXIMUM of 3 minutes in length and NOT contain any abusive/offensive content, product placement or copyrighted content (including background music). By submitting your video you grant Palapon the right to use it however deemed necessary, including for promotion on our website/social media, for evaluation by our judges and general public. Entries must be submitted to our website palapon.com/reborn and the entry form fully completed. The decisions of the judges and general public are final. You must be able to travel to Palapon in Thailand ANYTIME between closing date and 31st July 2019 and available to stay for the FULL 2 month program. Palapon will arrange and pay for your flights to and from Thailand. You must ensure ALL details requested are correct to ensure travel can be booked accurately. You grant permission to be filmed throughout the duration of your stay and full rights of all content to Palapon. You agree to be respectful to other residents and abide by camp policies. If for any reason you are NO longer able to come during the specified dates or for the full duration, or you are not contactable; you will LOSE your opportunity and the prize will go to the runner up. A huge part of what we do centers around assisting you to reach your goals. We make a commitment to each of our guests and we take that commitment very seriously. Weight Loss, Fitness and Martial Art is different for everybody, and therefore we tailor your journey and your Program specifically for you to make to the most of your time. At Camp Palapon your physical health and fitness is a priority for which we have designed both our Health Check and Monitoring system specifically for our program of activities. However we cannot and do not present our Health and Fitness test services as an alternative to the opinion of a qualified physician, to whom your full medical history has been disclosed. It is your sole responsibility to ensure you have disclosed any relevant medical condition and have followed any medical advice you have previously been given. Any injury or illness resulting from a failure to do aforementioned will remain the sole responsibility of the participant. When you arrive on the Program we will asses you and we will both set a goal for the duration of the Program. We will asses you again on your last day to ensure we have fulfilled out commitment to you in this regard. It is your responsibility to ensure that you have been signed off by a doctor for good health before commencing the program. You must notify your trainer of any health condition which could affect your safe participation. Palapon does not accept liability for injury or illness sustained during your stay. We strongly encourage all our customers to take insurance for the full duration of their stay and all the activities provided. Guests of the Weight Loss Program must only eat the foods provided to them by their Program facilitator, which have been recommended specifically for them by our Nutritionist. Guests may NOT bring food from outside etc. and follow on Sunday off the nutritional guidelines recommended. - non participation in their program (unless for medical reasons). - engaging in behaviour detrimental to other guests. Although Palapon will provide all dietary and other health-related consultancy advice and exercise programs with all the skill and care to be reasonably expected of an appropriately qualified provider of such services, it gives no other warranties or guarantees as to the precise results of the Program. The success of the Program for you will be directly influenced by your current health and body type. Self-discipline and effort will be required from you in order to ensure maximum benefit. To the maximum extent permissible in law: a) all warranties, whether express or implied by statute, common law or otherwise are excluded; and b) in no event shall Palapon, nor any of its employees, agents or other representatives be liable for any special, incidental, indirect or consequential damages whatsoever, including without limitation damages for loss of profits or any other pecuniary or other loss whatsoever arising from or in connection with any of these Terms and Conditions. You may not assign or otherwise transfer any of your rights under these Terms and Conditions. If any provision of these Terms and Conditions is found to be invalid by any court having competent jurisdiction, the invalidity of that provision will not affect the validity of the remaining provisions of these Terms and Conditions, which shall remain in full force and effect. Any tolerance or lenience by Palapon respect of a breach by you of these Terms and Conditions shall not constitute a waiver by Palapon and it will still be entitled to all rights and remedies available to it under these Terms and Conditions or at law. Palapon shall not be responsible for any breach of these Terms and Conditions caused by circumstances beyond its control. A person who is not a party to these Terms and Conditions shall have no right to enforce any term of these Terms and Conditions but this shall not affect any right or remedy of a third party which exists or is available. These Terms and Condition and any separate agreements whereby we provide you Services shall be governed by and construed in accordance with the laws of Thailand.